I've been thinking about getting a Silhouette die cutter and a fabulous friend of mine told me to go check out tatertotsandjello.blogspot.com; guess what - they're doing an awesome giveaway and the prize is a Silhouette and some other goodies. Please go check it out and enter, you've got till June 29th. How exciting! Well it's here, the latest blog contest that I'm participating in. 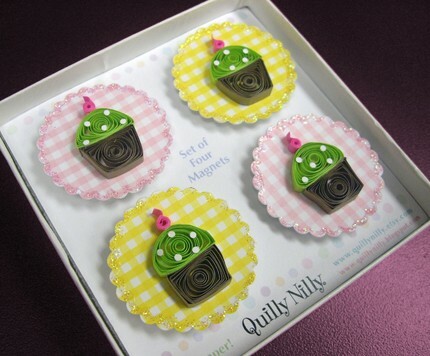 Please visit my shop at www.quillynilly.etsy.com, leave a comment about your favorite item at http://getcupcaked.wordpress.com/2010/06/17/62/ and you'll be entered to win a set of 4 quilled cupcake magnets, as seen above. She's also running a contest to help pick the name of her "signature" cupcake - the one I based my magnet's on, if you can come up with a name you can also leave that in the same comment section of her blog. The other part of the giveaway is for residents in Connecticut who can get to Sara J's, they'll be entered to win 6 delicious "signature" cupcakes. Good Luck! With Father's Day approaching I wanted to create a card for the occasion. Masculine cards are difficult for me, especially with quilling - the look of twirled paper is so pretty that I normally shy away from using it on masculine cards. Well I sat down and sketched out some icons I thought might work, for the first card I decided to use a tone on tone paper I've had for a year or so - tore the edges then layered it over a coordinating stripe pattern; then covered the front of the card. 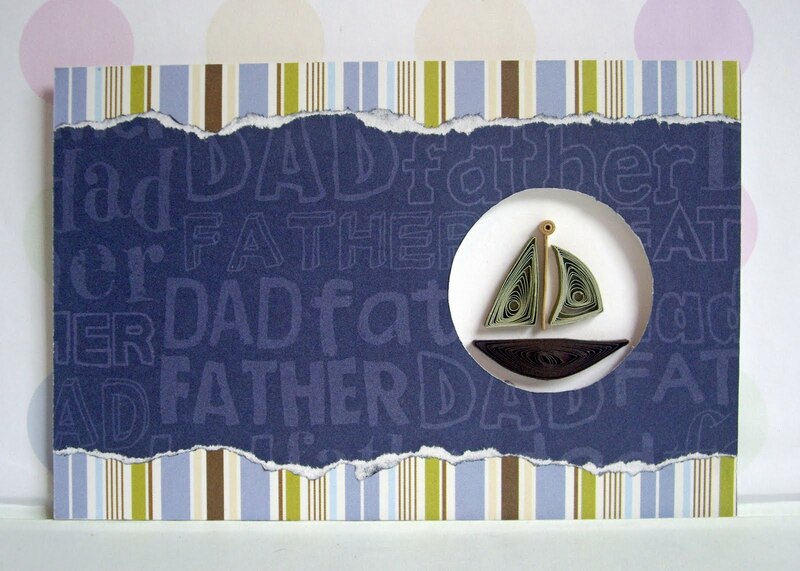 The round area that is die-cut out of the card was perfect for my quilled sailboat. 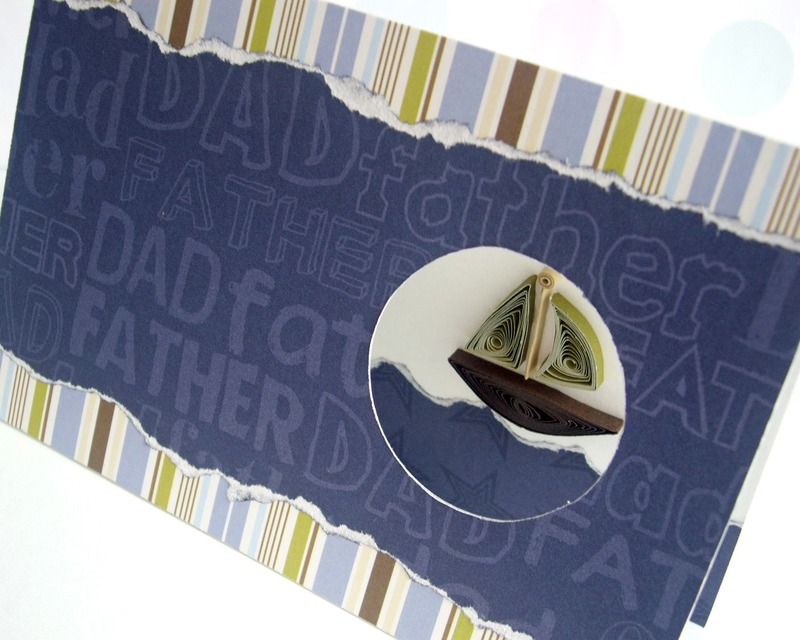 Now, on the opposite side of the tone-on-tone "dad" paper is stars; I used that to represent the waves of the ocean. I then started going through some quilling books and saw the shirt card with a quilled tie. 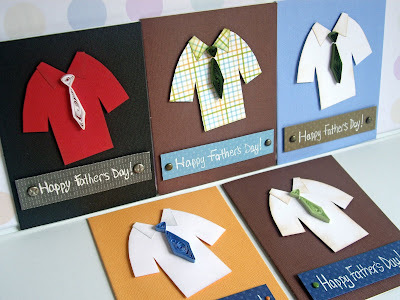 I normally do not like to copy other's, I decided to use this concept but I added a collar to my shirt; and also picked patterned paper for one of the cards - tried to make it a little more me. I had two coworkers place orders for these cards. 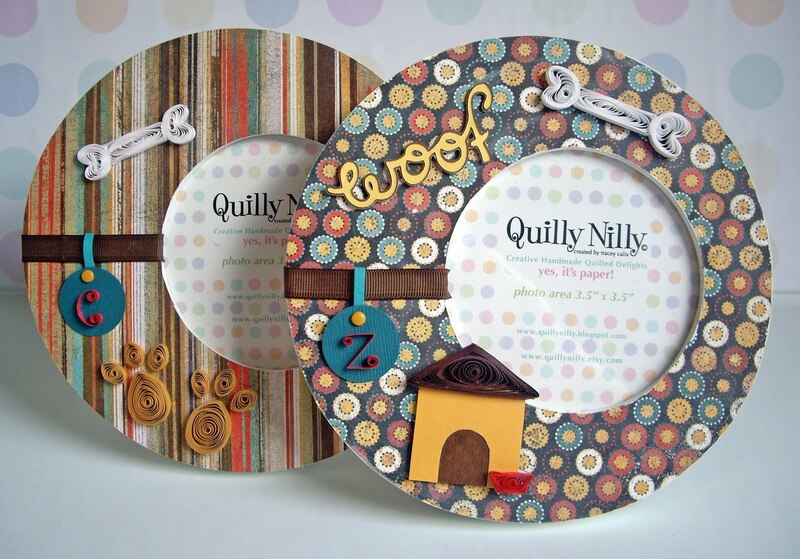 The other project I worked on recently was a set of frames with a dog theme. I immediately fell in love with these patterned papers, purchased them weeks ago but didn't really get into the quilling part until this past weekend. I sketched out some doggie icons and got to work creating them. These frames were a little out of my comfort zone, I normally do bright, flowering, pretty things - so working on these were a bit of a challenge but I was pleased with how they turned out and the recipient absolutely loved them. 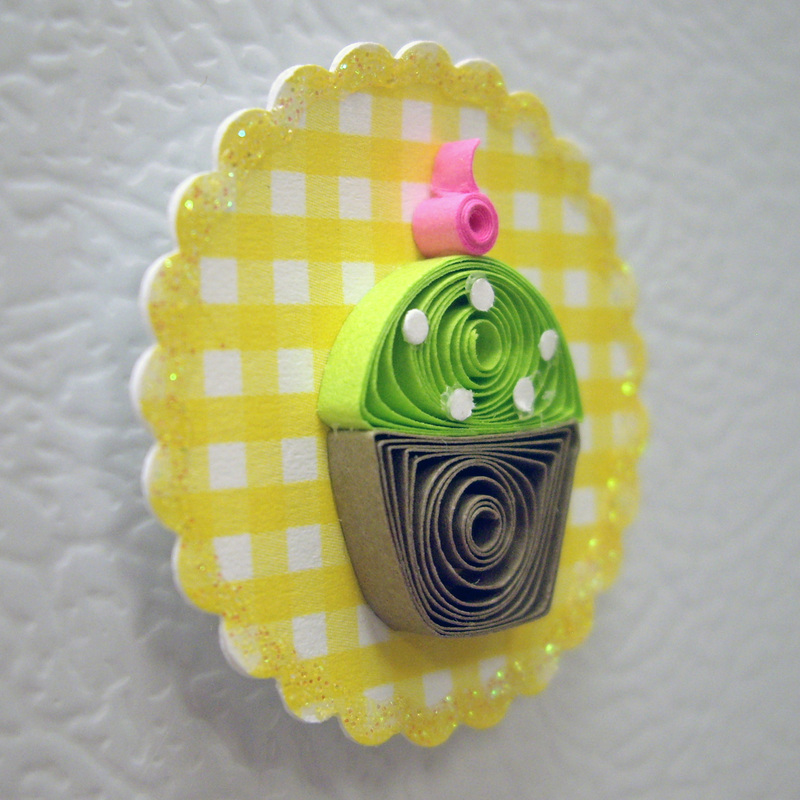 I wanted to give you a sneak peak at my new set of cupcake magnets I created for an upcoming blog giveaway. The girl who is hosting the blog giveaway creates cakes and cupcakes and sells them out of her mom's restaurant in Connecticut. I met her step mom Nicki at a craft fair here in Bartlett Tn last December; I always think it's neat to find someone else here from Connecticut. 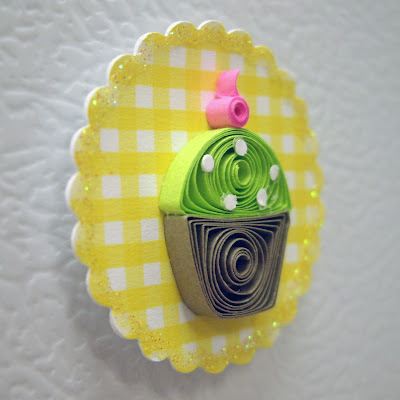 She asked me if I'd be interested in participating in Sara's blog giveaway, which I was; Sara gave me her signature colors and I created these cute little magnets to match. Once I get all the information I'll be back to let you know. 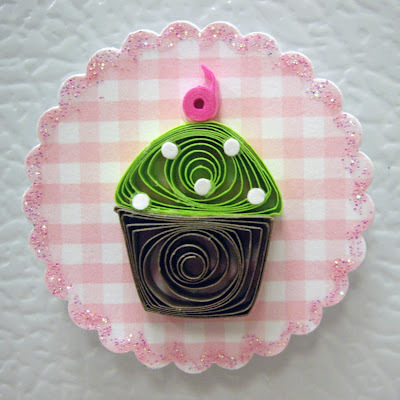 Till then, feel free to check out some of Sara's cakes here on Flickr, and Nicki's etsy shop Marchese Creations (lovely elegant, romantic and vintage jewelry designs).